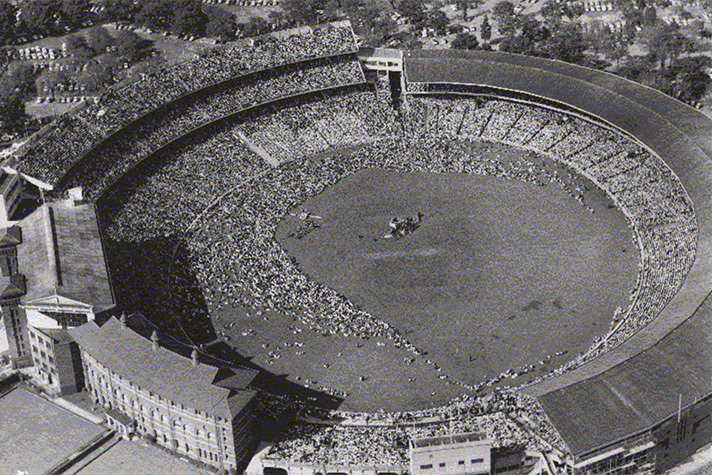 Q: Which famous Australian stadium first broke its attendance record during a Billy Graham Crusade? In 1959, he got his chance. Responding to invitations from cities across Australia, he made the long journey to the land down under. The first stop on his three-month-long Southern Cross Crusade was Melbourne. >>Watch Billy Graham’s 1959 message from Melbourne in this 2-minute clip. At first, the Melbourne Crusade events were held at an indoor stadium, but the crowds were too large for the venue. Mr. Graham ended up preaching two times a night—once to the people inside and again to the overflow crowds waiting outside, sometimes in the pouring rain. After five days, the meetings were moved outdoors to the Sidney Myer Music Bowl and then to the Agricultural Showgrounds on the outskirts of the city. >>What was Billy Graham’s simple yet powerful message? Find out. As tens of thousands of people showed up night after night, the decision was made to hold the final event in the city at the Melbourne Cricket Grounds (MCG), a massive outdoor arena and former Olympic venue that is still the largest stadium in the Southern Hemisphere. 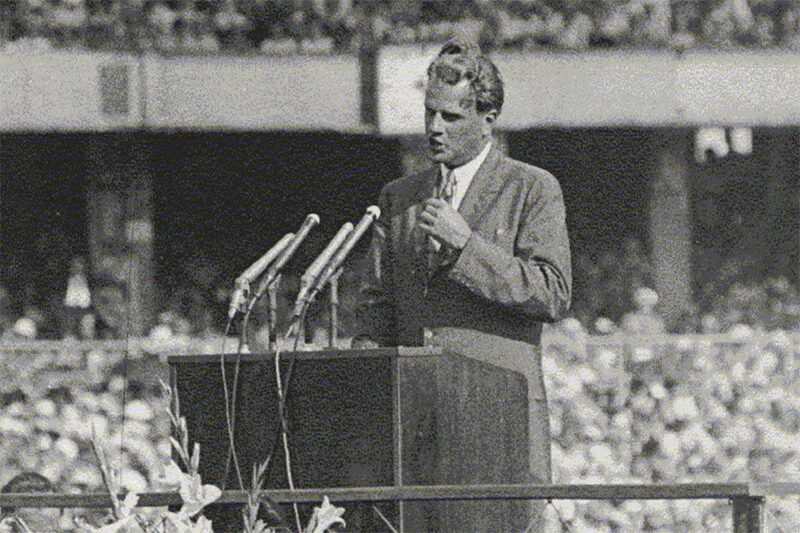 Billy Graham preaching at the Melbourne Cricket Ground on the final night of the 1959 Melbourne Crusade. Photo courtesy of The Billy Graham Center Archives at Wheaton College. Two hours before the event, Mr. Graham met with the directors of the Cricket Ground, who predicted a crowd of 50,000 people. But a short time later, the manager of the venue sent word that the stadium—capacity 105,000—was full. He had to lock the gates with thousands of people stuck outside. 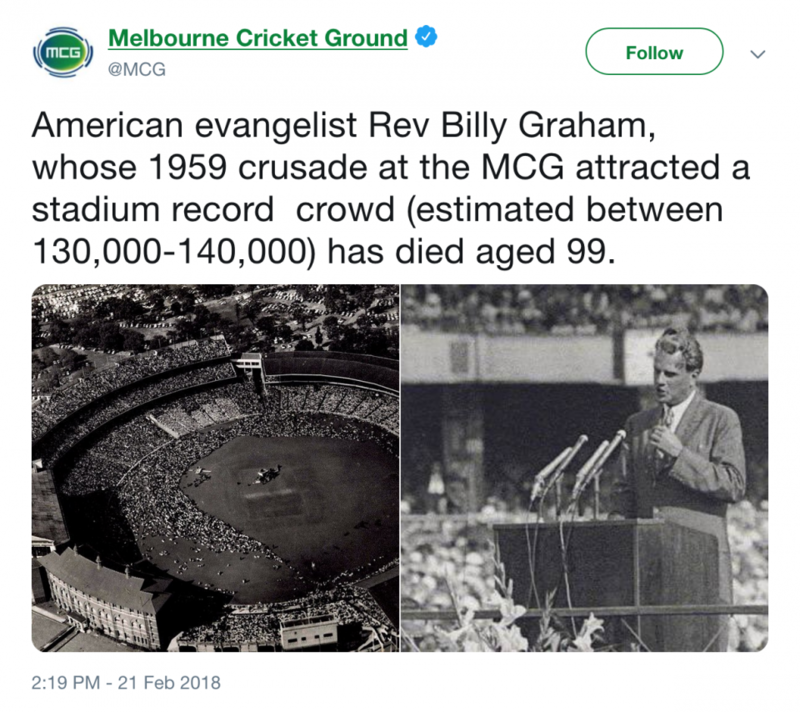 When Billy Graham went to be with Jesus on Feb. 21, 2018, the Melbourne Cricket Ground made the above post on Twitter in remembrance of his 1959 visit. It’s estimated that 140,000 people heard Mr. Graham share the Gospel of Jesus Christ that night. It broke the attendance record for the MCG, and the record still stands. He went on to share the message of God’s love all across Australia and New Zealand. It’s estimated that nearly one in three Australians attended a Crusade event in 1959. The Billy Graham Evangelistic Association continues to receive messages about the lasting impact of the 1959 tour and the additional Crusades held in years thereafter. Sixty years after Billy Graham’s whirlwind tour of Australia, his oldest son Franklin Graham is heading to the continent to share the love of Jesus Christ. Find out more about the 6-city Graham Tour happening in February. Do you have peace with God today and hope for the future? If not, start here.